How to Fill UG Online Admission Application Form, How to Pay Fee thruogh UG Online Admission Payment Form, how to give Web Options, How to fill Student Details Form for TS Online Degree Admissions, #DOST - Degree Online Services Telangana,TS Online Degree Admissions 2018 Schedule notification, Apply online for degree admissions in Telangana Universitie @ dost.cgg.gov.in: Osmania, Kakatiya, Telangana, Mahatma Gandhi, Satavahana and Palamuru Universities have issued the Online Degree Courses/Under Graduation(UG) Courses admission notification and UG Online admission application forms are invited from the eligible students through online mode for registration and admissions into various ug/undergraduate courses, such as B.A., B.Com., B.Sc., B.B.A., B.C.A., etc., offered by various colleges affiliated to all Universities in Telangana, which includes Constituent, Government, Aided, Autonomous and Private Colleges for the academic year 2018-2019. 6 Universities have introduced online application for admission into degree first year courses this year. The decision of TSCHE, all the admissions for degree courses in constituent, government, aided and private colleges under the jurisdiction of 6 Universities in Telangana State would be made online from this year onwards. Students have to register their names and fill the application on the varsity’s website www.dost.cgg.gov.in on payment of Rs. 100 through credit card/debit card/net banking. The submission of applications would begin on May 10 and the last date is May 26. Students have been provided a number of options to choose the courses and colleges of their choice. Only one application is sufficient for all colleges/courses under example: Kakatiya University. Twelve helpline centres in Warangal, Khammam and Adilabad district at different colleges have also been setup to guide the students. 8. Sports, NCC, NSS, CAP and PH scanned certificate copies in case of availing admission under the special category. 1. You need to fill in the "Student Details Form" only once. 2. You have to pay Rs.100 for seeking admission in each university separately. 3. You may apply for unlimited number of colleges within a university. 4. You may apply for more than one combination within the permitted undergraduate programme. 6. All the students, other than Board of Intermediate Education, Telangana and Andhra Pradesh should get their eligibility and equivalence certificates and approach nearest helpline centres of the respective Universities for verification. 7. All the students, who applied under special category ie., NCC, NSS, Sports, CAP should get their certificates verified at helpline centres of the respective Universities. Dates will be informed in advance for each special category. Officers of concerned departments will be available for verification of the special category certificates. 2. You will find the home page with the six university logos and various instructions, information of Colleges, Courses etc. 3. Thoroughly read all the instructions on the home page such as Check List, Student Instructions and browse the Colleges and Course list . 4. Select a University to which you want to apply by a click on the University Logo . 5. UG Online Admission Payment Form will appear. Please fill in the Student Details in the form. 6. After filling the UG Online Admission Payment Form click on Proceed to Payment button. 7. Payment gateway page will appear. Pay your online application fee using your Credit Card / Debit Card / Net Banking facility. 8. If payment is successful you will see a message which looks like below.
" Your payment was Successfull for Rs.100/- on DD/MM/2016...Your Transaction Id is XXXXXXXXXX and Acknowledgment no. for your Application is: XXXXXXXXXXXX"
9. Please write down your application number. Also you will receive SMS with your application no. to your registered mobile no. 10. Click on the application button next to home, the UG Online Admission Form FOR ACADEMIC YEAR : 2016-17 will appear. 11. For students of Board of Intermediate Education, Telangana and Andhra Pradesh, some of your information will be auto filled by the software and you complete the remaining information. 12. 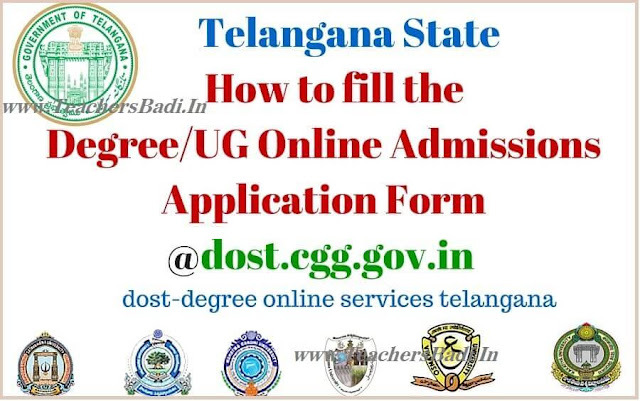 For students who belong to the boards other than Board of Intermediate Education, Telangana and Andhra Pradesh all the details must be entered by the student. 13. Please enter equivalent percentage of CGPA accurately. 14. After furnishing all the details, click on the Preview button. 15. Verify your Details once again and Press "SUBMIT" button to submit UG Online Admission Form. 16. TS UG Online Admission Registration Payments Status and Web Options page will appear. 15. If you wish to pay for another university select "Pay Another University" and complete payment formalities. 16. When you opt for another university you will not have to fill in the UG Online Admission Form once again. 17. To Excerise Web Options click on "Click for Web Options" link. To Exit click on LOGOUT.